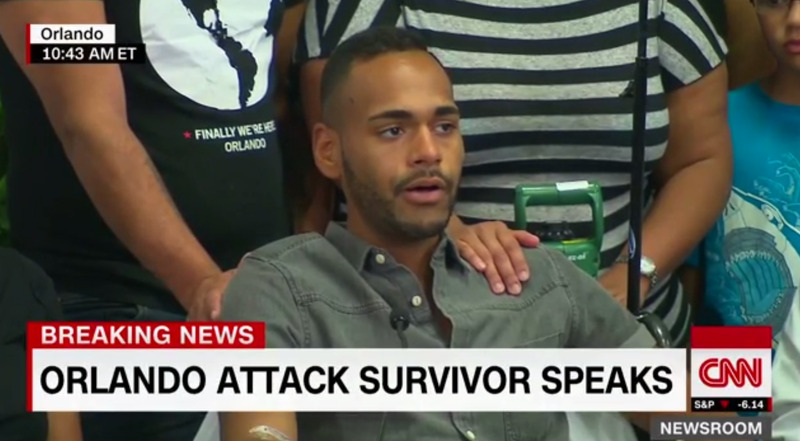 CNNAngel Colon, a survivor of the mass shooting at Pulse nightclub. 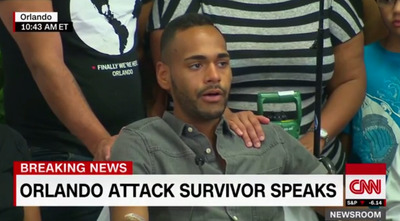 Injured survivors of Sunday morning’s massacre at the gay nightclub, Pulse, in Orlando, Florida told their stories at a press conference from Orlando Regional Medical Center on Tuesday. 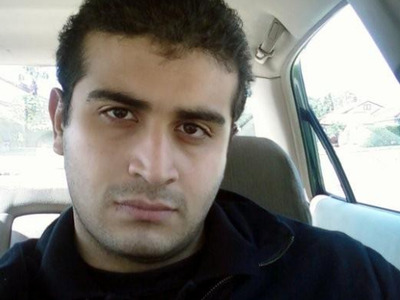 By Colon’s recollection, the gunman, who has since been identified as 29-year-old Omar Mateen, opened fire on the club’s dance floor before moving toward the bathrooms. “All I could hear were gunshots,” said Colon, who was shot once in the leg when the gunman first started shooting before falling to the ground. His leg was shattered when clubgoers trampled over him while trying to escape the shooter. When the gunman came back from his first wave of gunfire, he began shooting every person laying on the floor multiple times to make sure they were dead, according to Colon, who was laying on the ground and playing dead. Colon was shot twice by the gunman — one bullet grazed his hand, while another hit his hip. “I’m thinking, I’m next, I’m dead,” he said on Tuesday. Another survivor, 20-year-old Patience Carter, said she ran into the Pulse nightclub bathroom when gunshots started ringing out inside the club. She was in the bathroom when the gunman entered and started shooting wildly. She said the killer asked if any black people were in the bathroom, and one man replied that there were. “I don’t have a problem with black people,” Mateen said, according to Carter. “This is about my country. You guys have suffered enough.” He then began calling out to people laying on the floor — “Hey you!” — before shooting them one by one. Mateen also told them he had “snipers” outside of the nightclub, Carter said. in separate interviews with CNN on Monday and Tuesday. Casiano told Anderson Cooper said that Mateen, the gunman, laughed every time he shot someone. Caisano said Mateen used his handgun to shoot over the bathroom stalls into where people were hiding and pleading with him to let them go. “One of the first things I hear when I close my eyes are guns, bullets hitting the floor and that laugh,” Casiano said. Michael Belvedere, a bartender at Pulse, told Erin Burnett on Tuesday that he didn’t run from the chaos right away, because he thought it might have been a police officer. But the gunshots continued and starting sounding “like they were on top of me,” so he ran toward the club’s dressing room and hid. He said he heard the shooter yell “Get down, Motherf—ers!” and tell the clubgoers to put their phones away before opening fire. The gunman made people beg for their lives before killing them, Belvedere said. Chadwick Smith — one of the trauma surgeons who operated on the shooting victims as they came into Orlando Regional Medical Center on Sunday morning — got emotional while recalling the frantic calls and visits from the victims’ families, who did not know where their loved ones were. “Patients just started coming in, one after another,” Smith told reporters on Tuesday. “We’re very fortunate this occurred blocks away.” The Medical Center is down the road from Pulse. “It was a surreal experience,” said William Havron, another trauma surgeon at the hospital. The shooting at Pulse is the deadliest in US history. Forty-nine people died, and 27 patients are still in the hospital. Six are in critical condition.